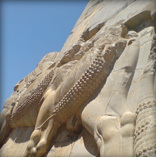 Persepolis, where we were lucky to not have rain upon our visit. "Have you seen or heard the news today? ", I eagerly asked with each fresh local face that introduced themselves to the group. "You know, the fifteen British sailors, have you heard anything? ", was my fourth question, and like the third it was also answered with a no. "Do you Shiraz people watch the news or read a paper? ", no, they would also repeat. 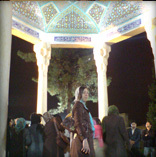 On the seventh day of the Iranian new year I'd left for Shiraz for a six day trip where we would join a dear friend for a long overdue visit. I was honored to have the company of my sister who was in Iran for a two week break, enjoying the reversal of sibling responsibility, among other things. Most of the trip was spent keeping a respectable amount of tourist activity going but we happily contended this by adopting a dose of local lethargy. The laziness was made easy by the unreal volume of rain which concluded in the thirteenth and last day of the new year celebration (a day traditionally known for bringing Iranians out to nature) reaching torrential conditions. "We'll be staying at the kid's house", my friend answered as we left Shiraz airport to drop our things off. This seemed to indicate that it would be another of his family's houses yet although I never dug deeper, I suspected this was not the case. We we're well catered for with a freshly stocked fridge and mountains of bedding, but the place bore little sign of being lived in before us. A small bundle of my friends belongings seemed to oddly fit with various cosmetics and girly things found around the house. Yet it was the empty, pink, lingerie package resting near my impromptu bed that invited the most questions. Like the house I wasn't sure who owned each of the different cars we used during the stay. I was however informed that my friend is still yet to pass his driving test, which made me mildly more comfortable about us taking it in turns to drive them. The lack of explanation seemed to ask for a lack of questions and as we overloaded the cars with more people than chairs I kept my mouth shut, as with every swerve and near miss. We did Persepolis, Eram Gardens, Imam Reza's brother's tomb (Shah e Cherugh), Hafez's tomb, Karim Khan's and the local amusement arcade. "You could have done twice that amount", a friend criticised, "it makes no difference to him, 'here's a stone a few thousand years old and here's a more modern one we call tarmac'", they joked. I wasn't complaining, there was no tick list and it's a good excuse to come back future.